The input was “design a pure cruising boat”. 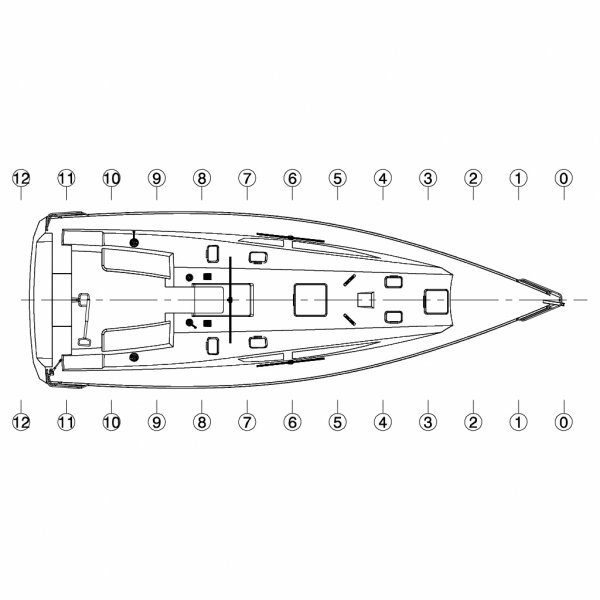 The boat has wide internal volumes, limited draft, average/high displacement and sailing area which do not require a continuos sail change. The hull lines have been developed both to corner and round. We wanted to realize something new for deck design. The deck loses the classical form; a continuos line englobes all the deckhouse. 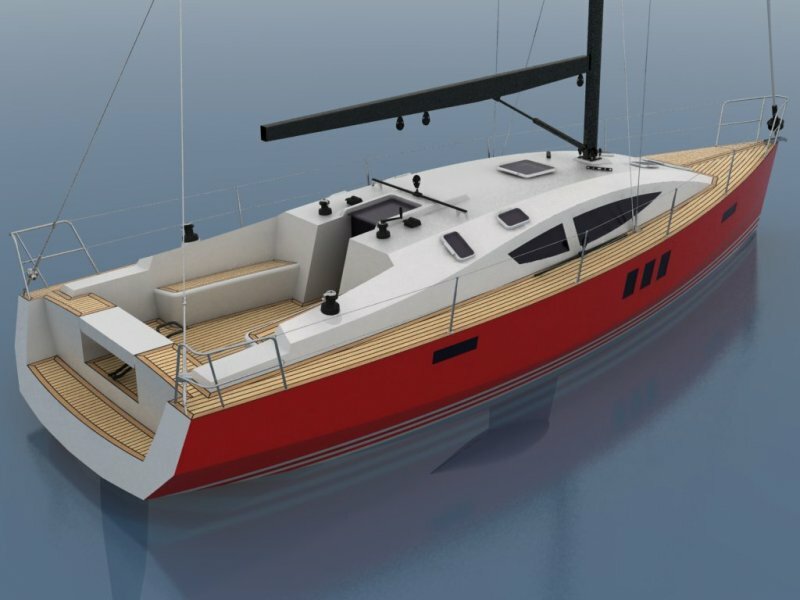 This new line will also simplify the construction in addition to giving to the boat a modern and aggressive aspect. The wooden building can be both in cpm and in stripplanking with rounded hull. We have expected also the building in L.L. thanks to the boat dimensions. The deck keeps the same geometry for all the materials and versions. The bulb is realized with a structural box of stainless steel which is bolted the torpedo of lead of about 1600 kg, everything coated in GRP. The rudder to high aspect ratio has the shovel in cpm and epoxy and the board of steel. The steering is with bar to simplify the construction, but there is also an optional version with double wheel steering to leave several free the movement in the cockpit. 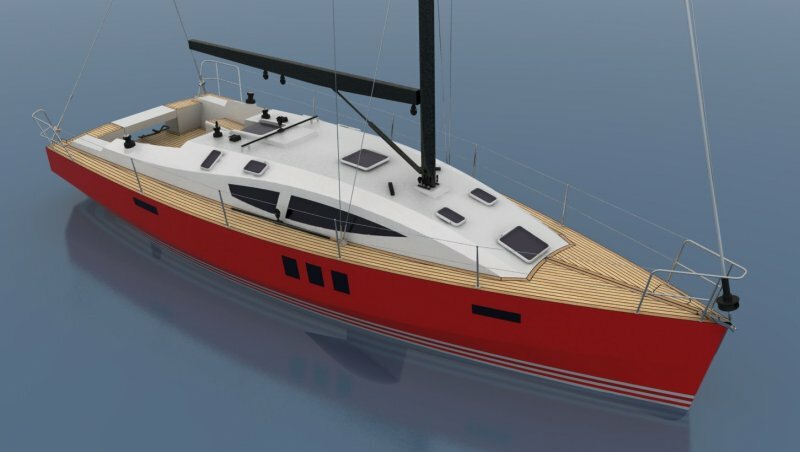 The Strip 39 sail plan has been developed whit long distance cruising in mind. 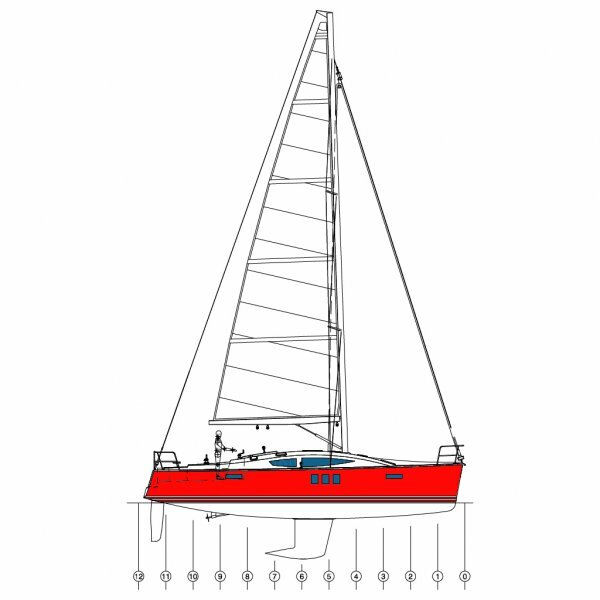 The mast is split with two with two swept spreaders of 20 °. The mainsheet led back on deck to free up the cockpit. For the carrying andatue, we thought to gennaker walled on the bowspring fixed in the deck. The deck has all led back to the cockpit. The long benches of 1.42m allow a comfortable seat to six crew people. Eight portholes and two hatches mounted on the deck ensure optimum aeration. The open transom, only concession to a racer aspect, is closed by a removable bench. 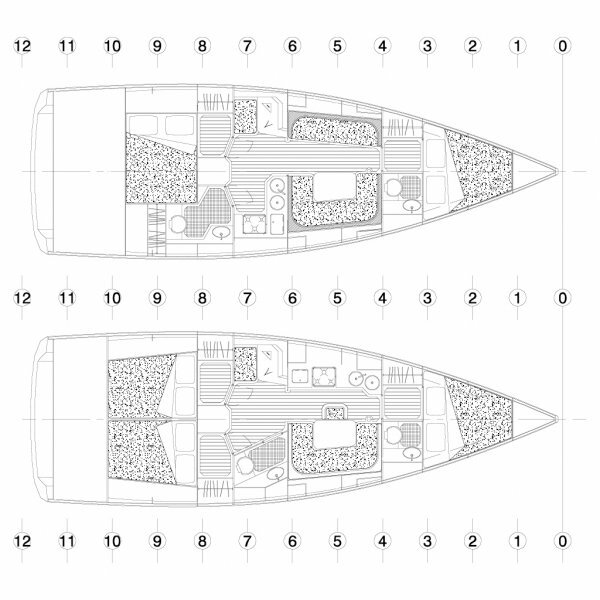 The interior of pure cruiser, with two versions and an internal height of 2.10m, offers hospitality to 6+2 crew or 4+3 depending on the chosen version. In the “charter” version we find a double berth forward with bathroom. Proceeding aft we enter into the dinette with a C-shaped sofa to starboard and the walled kitchen on the left. The chart table on the left is opposed to the toilet room on the starboard side.Proceeding towards the stern there is the engine compartment and the two cabins with double bunks. In the “owner” version we find a double berth forward with bathroom. Proceeding aft we enter into the dinette with a C-shaped sofa to starboard and a couch on the left. The chart table on the left, is opposed to the kitchen to the starboard. Proceeding towards the stern there is the engine compartment on the starboard , there is the toilet on the starboard while to the left we go to a double cabin aft.